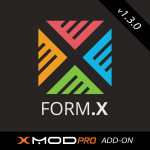 An outstanding addition for XMod Pro developers, it's a must have add-on that makes lightning quick form updates without the page reload. Have to see to believe how much quicker and elegant your pages will be. Thank you FormX !